Cats are well known to be mysterious animals and often have a reputation for being aloof, this might not necessarily be the truth though! 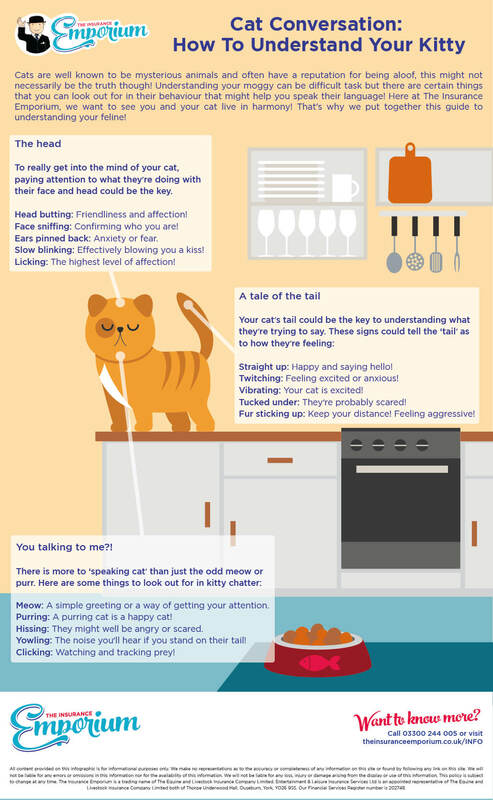 Understanding your moggy can be difficult task but there are certain things that you can look out for in their behaviour that might help you speak their language! Here at The Insurance Emporium, we want to see you and your cat live in harmony! That’s why we put together this guide to understanding your feline! Meow: This is a very generic bit of ‘cat chat’ and could be a simple greeting or simply a way of getting your attention. Purring: Everyone knows that a purring cat is a happy cat! Hissing: If your cat is hissing then they might well be angry or scared. Yowling: This is often the noise that you’ll hear if you accidentally stand on their tail! Clicking: Your cat is probably watching and tracking some prey! Straight up: Your feline is happy and saying hello! Twitching: Kitty is feeling excited or anxious! Vibrating: Your cat is excited! Tucked under: If their tail is tucked under them then they’re probably scared! Fur sticking up: Keep your distance, your cat is feeling aggressive! To really get into the mind of your cat, paying attention to what they’re doing with their face and head could be the key. Head butting: A sign of friendliness and affection! Face sniffing: Confirming who you are! Ears pinned back: This is a sign of anxiety or fear. Slow blinking: Your cat is effectively blowing you a kiss! Licking: This is the highest level of affection your cat could show!